﻿Sesshomaru is known and feared by many demons and humans everywhere, He has surpassed his father: Inu no Taisho ' The Great Dog Demon ' in strength and power, gaining a new sword of his own ' The Bakusaiga' . The time has now come for him to begin building his empire in the Western lands. Many demons are happy and willing to be in his service and begin to work on the huge castle that will belong to the Majestic Dog Demon. Sesshomaru has recently become aware that there is another full blooded demon that is as strong and powerful as he is. The demon's name is Zeref. He is a Lion Demon who also takes on humanoid form but his true demon figure is enormous and terrifying to most other demons. He has his own empire to the East of Sesshomaru's land but Zeref is greedy for a bigger and more powerful empire. In the past, he had requested for Sesshomaru to be his 2nd in command as part of his empire however Sesshomaru had refused his offer. Zeref, wanting to own an empire in as many regions as he can, is now at odds with Lord Sesshomaru and will not give up until he can rid himself of his competitors and have complete control over all of Japan . Sesshomaru is not intimidated by this demon and is determined to fight for his empire. Sesshomaru intends to pass this empire on to his full blooded demon son 'Heroshya' in which a full demon woman bore for him 9 years ago. Sesshomaru still carries the Tenseiga, a sword made up of his father's fang and the Bakusiaga, a sword created of his own power. Jaken continues to remain at Sesshomaru's side and for all of his faithful years of loyalty and service, as promised he has become Lord Sesshomaru's Chief Minister. Sesshomaru watches as demons from all over and many tribes continue building and creating his castle while Jaken comments, "Lord Sesshomaru, your dream of being a powerful demon with your own empire has happened so quickly. It is absolutely magnificent Milord!" Sesshomaru does not comment on Jaken's remark and expresses no excitement as he begins to walk off from the area. Jaken shouts out again, "Oh milord, where are you going? Shall I come with you?" Sesshomaru responds, "I'm going to visit with Rin, Come along if you so choose." Jaken replies with excitement to see Rin, "Oh certainly milord." Meanwhile, Rin has been living with Lady Kaede from the time she was 8 years old until now. Rin will be turning 18 years old in 3 days; she is extremely excited about this because she feels that she is coming out of childhood into woman hood. Rin, thinking about her 18th birthday soon to come, is in good spirits this morning as she finishes her breakfast and chores quickly. She will be meeting with Kohaku and lady Sango for demon slayer practice as she has been doing most days for the past 7 to 8 years. Rin is becoming so proficient in demon slaying, she is almost surpassing Lady Sango in skills however, Kohaku and Lady Sango feel frightful to let her join Kohaku in an actual demon slay job but the time is approaching for her to get real life experience in this. Kohaku and Lady Sango both agree that they had better get Lord Sesshomaru's approval before they can allow Rin to take this risk. Kohaku meets with Rin by the early afternoon and needs to talk with her about this. Lady Sango was not able to join them due to one of her children falling ill so Kohaku talks to Rin alone about their next steps, "Rin, there is not much more that we need to teach you and your demon slay skills are excellent. You have been a fast learner and you move with great speed and perfection. Your survival skills make you a fast thinker which is essential in the art of demon slaying, So now the time has come for you to attempt your first real demon kill, are you ready and willing?" Rin is brave also very much ready and willing as she responds, "I am ready Kohaku but I only ask one thing, Please let us do this after my 18th birthday. Toran has set up a special birthday celebration for me and I want to be there to enjoy it and I must see Lord Sesshomaru and master Jaken once more before I may possibly die. Although I will fight long and hard and not give up, I may at any time perish in this battle with the demon." Kohaku replies understandably, "Very well Rin". He thinks to himself: This will give me time to speak with Lord Sesshomaru and obtain his approval to let Rin join in the battle, What will he say I wonder, will he cut me down with his mighty sword for even suggesting such a fool thing? Kohaku begins to start his days training with Rin and suddenly remembers Rin said that Toran was setting up a special birthday celebration. Toran??? The leader of the Panther Demon Tribe? Kohaku expressing confusion: "Uh, Rin did you say Toran was going to have a celebration ceremony in your honor? How do you know her? I thought she hated Lord Sesshomaru?" Rin begins to explain to Kohaku that The Panther tribe that once had rivalry with the Dog Demons are now faithful followers of Lord Sesshomaru and are still greatly indebted to his act of returning their souls to them with his sword, the Tenseiga. The leader of the panther tribe, Toran, Once encountered Rin when she was 11 years old at an area in the forest near a lake picking berries for Kaede to bake a pie. Rin with her sweet, naive personality recognized that Toran was a demon and feeling comfortable around demons (that do not automatically attack her) Rin befriended the woman and after many hours of talking, Toran began to grow a fondness for the girl. Rin talked to Toran about her life in the human village then and now, she also mentioned Lord Sesshomaru and her travels with him. Toran remembered the day that she recalled seeing a little girl with Sesshomaru when she challenged him to a battle to settle the score. "Your the little girl that was companion with Lord Sesshomaru?" Knowing this, she immediately decided to make the young Rin a welcome addition to her tribe; from then on Rin was invited to visit them anytime and join them in festivities and gatherings as a show of thanks to Lord Sesshomaru for what he had done for her and her tribe. Now today 7 years from that time and 3 days before Rin's 18th Birthday, Toran is going to throw a huge celebration for Rin and all the humans will be invited along with their tribe of Panther demons whom have also grown to like and care for Rin. 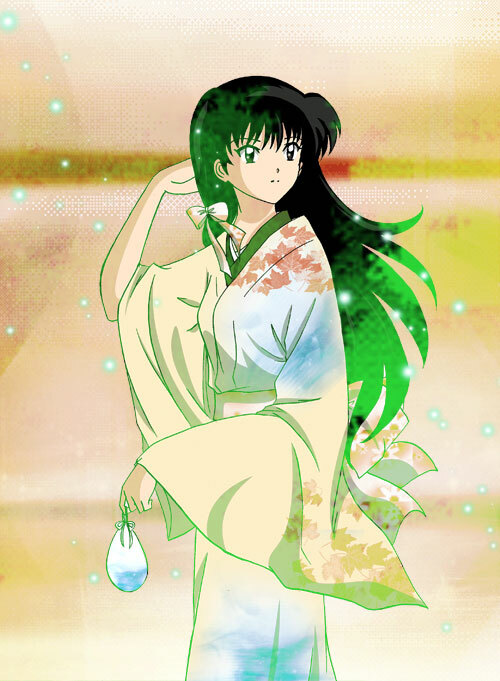 Toran wants this day to be unforgettable for her and has had a gorgeous kimono dress created, special for this occasion only to worn by Rin on the celebration day. Kohaku listened to Rin explain how she met Toran & how the whole Panther tribe are all very fond of her and how they now show great respect and homage for Lord Sesshomaru. Kohaku thinks: Well this is outstanding , Rin has a whole Tribe of demons looking out for her, this means she will have strong demon allies at her side when needed and all this because of her beautiful smile and warm personality, Amazing. Kohaku stares at Rin standing there, she looks so mature and beautiful. He can remember when she was just a little girl and now she has grown into a beautiful woman. Rin's hair is long and dark brown, The little pony tail that once protruded to the side is now long with a big curl at the end, sometimes she wears her hair completely out without the side ponytail and Kohaku thinks she is most beautiful that way. Her once shapeless, girlish body has now blossomed and her smile is the most enchanting that he has ever seen. She is always so sweet and thoughtful. Kohaku is 22 years old now, he has been spending many days, months and years with Rin teaching her the Demon slaying skills and during these times he finds himself most attracted to Rin and wants to one day find the courage to ask for her hand in marriage. Rin and Kohaku spar with each other for a couple of hours. Kohaku has plans for Rin's 18th Birthday also. As his gift, he is having a special weapon created for her demon slayings called a Naginta. The Naginta is a weapon that has a long stick that can contract in or extend out swiftly, it has a very large and deadly blade like hook at the end of it, perfect for what she will be using it for. Kohaku wants to keep it a surprise until her birthday. It is an extremely hot day so Rin and Kohaku decide to call it quits on practice for now. Before he leaves Kohaku explains, "Rin, I know you will probably see Lord Sesshomaru soon." Rin replies "Yes, He should be by some time today. I can't wait to see him and Master Jaken." Rin at that moment thinks to herself: I wonder if he will ever let me travel with them again now that I can defend myself. Kohaku continues, "Well Please don't mention to him that you may go out on a Demon slay with me after your 18th Birthday celebration. I must speak with him first and get his blessing." Rin nods her head, "Yes, I understand. I will leave it to you first." Rin then giggles and says, "I don't want to be there when you mention this to him, I may burst into laughter once I see you shaking the ground with fear." She laughs a little and Kohaku thinks it is so cute. Defending himself he says, "Well he is pretty intimidating sometimes, what do you expect? Who wouldn't be shaking with fear, he may kill me even at the suggestion of having you go out to fight demons." Rin stops her laughing for a minute and suggests, "Maybe I should tell him Kohaku, I'll tell him that this is what I want to do and I need his blessing." Kohaku agrees, "hmm, maybe you should." Rin replies, "Okay, I will." Then she says softly and playfully "Big Chicken" Kohaku shouts, "HEY, who you callin' a chicken?" Rin runs off laughing as Kohaku playfully takes chase and grabs a tight hold of her from behind while saying, "Take it back and I'll let you go!" Rin laughs harder and says, "No way, Stop being such a chicken and I'll stop saying it." Just then Kohaku looks up and he can see Lord Sesshomaru slowly walking up with Jaken. Rin shouts out in excitement "LORD SESSHOMARU!!!" Kohaku lets her free from his grip and goes to walk off to give them privacy. As he walks past he nods and says, "Good Afternoon Lord Sesshomaru." Sesshomaru nods back slightly. Rin speaks first, "Lord Sesshomaru I'm so happy to see you. Hello Master Jaken I'm so glad you decided to join Lord Sesshomaru in visiting me." Jaken replies "Quiet you foolish girl, It's not about you....A good chief minster follows his master and lord everywhere he goes, however it's still nice to see you Rin." Sesshomaru speaks, "Rin you're looking well today. I see you have been training again." Rin Replies, "Oh yes Milord. I have so much I need to speak with you about...might we sit by the lake and talk?" Sesshomaru, Jaken and Rin go by the lake and sit while Rin does most of the talking telling him about her special honor begin presented to her by the panther tribe on her birthday, requesting that he come and join the event, time and days she has spent with helping to care for Lady Sango's kids and she talks to him about her training trying to slowly lead up to wanting to go out on a demon slaying mission with Kohaku. Rin finally comes to this moment and says, "My training is complete, there is no more for Kohaku and lady Sango to teach me, I feel like I'm ready to go on a real demon slaying mission with Kohaku, right after my 18th birthday." Jaken listening to everything suddenly gasps "HUH, Lord Sesshomaru...did you hear what this foolish mortal girl has just suggested??" Sesshomaru replies, "Jaken, Leave us." Jaken steps away as ordered and for a moment Sesshomaru closes his eyes as he thinks to himself: It may be time for her to leave this village and come back with me, I can not have her out slaying dangerous, powerful demons that are not under my command." He then stands up and speaks out loud, "Rin, This is extremely foolish. You were to train with Kohaku and Sango only to learn to defend yourself, not to become a demon hunter and slay demons for the sport of it. " Rin quickly replies, "Milord, how am I to react when an actual demon comes after me if I am not allowed to practice slaying any real demons? The only person I have ever fought was Kohaku and that was only pretend." Lord Sesshomaru responds, " I will think on it Rin, until I return to you with my answer, you are not to make a move on this, do you understand?" Rin stands up in front of him and complies defeated, "Yes Milord." Lord Sesshomaru then moves close to Rin and lifts her chin slowly with his finger and thumb. Seeing the disappointed look on her face he thinks: She grows more beautiful with each passing day, I hate to see this melancholy look on her face. He then gives her a soft kiss on her forehead. Rin's eyes open widely for a moment in shock and surprise, Her heart jumps a bit as she thinks: Oh my, Lord Sesshomaru has never kissed me before...what is this? She then looks up at him with a bit of confusion, he ignores the expression on her face and says, "I will return again soon, we will discuss this further then." Rin replies "Yes, Okay Milord." She then shouts "Good bye Master Jaken, See you next time!!" Jaken Replies "Good Bye Rin!" Jaken then looks up at Sesshomaru as they walk off and says, "Well, who does she think she is now... a great immortal warrior? Does she think she can just go killing malevolent, evil demons who...." Sesshomaru interrupts, "Jaken, Shut your mouth." Jaken Responds, "Yes Milord." Night falls and Rin is with lady Kaede in the hut cleaning dishes before bed. Lady Kaede is talking to Rin about the pies she needs to make for her 18th year celebration. Lady Kaede explains to Rin, "I'm going to need black berries, blue berries and red berries Rin and when you get the berries I want you to make sure they are washed and ready for me." Rin's mind is clouded with thoughts of earlier when Lord Sesshomaru kissed her. Rin thinks to herself: I still can't believe he kissed me. Why? What does it mean? Maybe I'm making too much of this but my heart skips a beat every time I replay his kiss in my mind. I've always kept Lord Sesshomaru in my heart ever since I was a little girl and I have been longing to spend my days with him once again. I wonder if his kiss means.......... "Child, are you listening to me?" Lady Kaede interrupts Rin's thoughts. Rin Replies, Oh I'm sorry Granny Kaede...I was thinking about Lord Sesshomaru, he came to visit me today." Lady Kaede responds, "Child you must not worry about Lord Sesshomaru right now, you have a lot of preparation to do for your ceremony...it's only a couple of days away you know." Rin Replies excited, "Yes Ma'am!!" The next morning Kohaku obtained possession of the Naginta weapon that he requested be created for Rin to use in her demon slaying battles. The weapon has been completed much quicker than anticipated so Kohaku decides he will give the weapon to Rin early. Kohaku knows that Rin will be so excited to get her new, very own weapon. Rin has picked the berries for Lady Kaede, wash them and spent time with Toran to try on her new dress and rehearse her grand appearance for the ceremony. As she is returning back to Lady Kaede's hut, she sees Kohaku and waves at him, "Good Afternoon Kohaku!" Kohaku yells back, "Rin, come here...I've got something for you. You're gonna love this." Rin asks curiously, "What is it???" Kohaku proudly pulls out the weapon and explains, "It's called a Naginta. This is a perfect weapon for you Rin, it has this long, sharp hook on it and It also has this staff that can extend or retract when you want it to....How do you like it? It's my birthday present to you Rin." Rin is so excited and happy that she has a weapon of her own, She expresses her gratitude by giving Kohaku a huge hug. "It's perfect Kohaku, Thank you so much!!" Kohaku embraces Rin and thinks: She smells so good and her hair is so soft, Rin...I wish we could be like this all of the time, Just you and I. " Rin asks Kohaku to please show her how to use it and for the rest of the day Rin and Kohaku carefully practice handling and mastering the Naginta. Two Days later, the Day of Rin's 18th year Ceremony. There is a huge amount of humans from the village where Rin spent her last 10 years living, All of the Panther demon Tribe, Kagome, Inuyasha, Lady Sango and the Monk, Their Children and Kohaku. Everyone is there except Lord Sesshomaru. There is a plentiful amount of food, pies and music from people of the village playing the Shamisen. Everyone below is dancing, drinking, eating and enjoying themselves while Rin is above in the Panther tower looking down over the crowd. She is wearing her beautiful, special made kimono dress that is a long flowing silky red gown and a flowered sash that wraps around her waist and down to the floor making her look extremely elegant. Her hair has a bang in the front and the back is pinned in an up do with flowers all around her hair. Toran is helping Rin adjust her gown while she continues to stare down from above at the huge crowd of people waiting for her to make her entrance. She expresses concern to Toran, "I wonder if Lord Sesshomaru will come to see me on the day of my 18th anniversary." Toran smiles at her and responds, "Oh Rin, Lord Sesshomaru has never disappointed you in all the years that you've known him. He will be here, Now I don't want you upsetting yourself, It's almost time for your grand entrance." Rin steps out of the tower to make her grand entrance while Toran presents her first, "Everyone, I would like to present to you the lovely young woman who has warmed our hearts, we are gathered here to celebrate her 18th anniversary and rejoice many more years of future joyful bliss. Here is our lady of honor, Rin!!" Everyone stands to clap and cheer as bundles of flowers are tossed in the air behind Rin while she slowly makes her entrance from the tower to the ground floor where the crowd is watching in awe of her elegant look and beautiful smile. Just then she sees Lord Sesshomaru and Jaken slowly making their way up. Rin Thinks: He did come after all, Oh Lord Sesshomaru you are so wonderful. Rin is unable to go to him since she is still making her grand entrance, when she reaches the bottom, guests of the celebration bombard her as if she were a queen and reach out to hug her and present her with gifts. 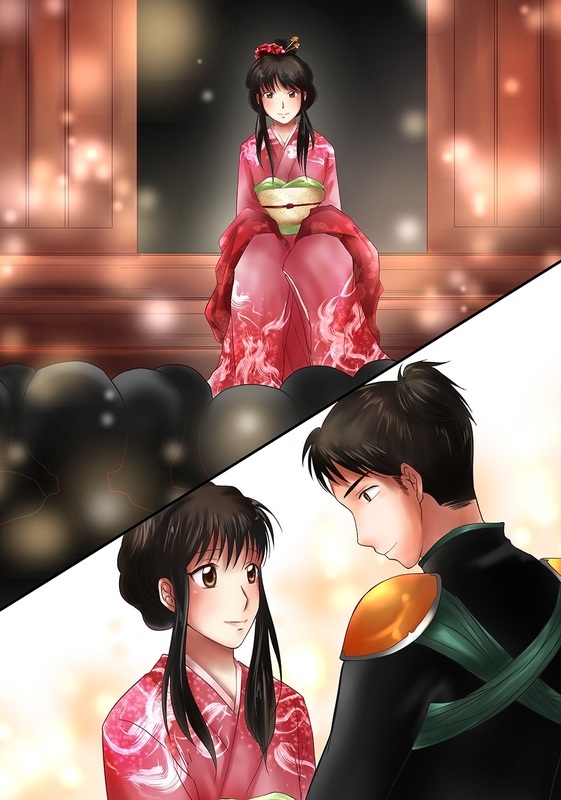 Kohaku makes his way up to her through the crowd, he is holding a huge bundle of beautiful roses and gives them to Rin. "Rin you look beautiful, May I have the first dance with you?" Rin smiles, blushes slightly and says, "Yes, I'd love to Kohaku." Rin and Kohaku and others from the celebration are dancing to music being played with instruments while Sesshomaru is watching Rin and Kohaku dance. Jaken taking notice, "Master, do you see Rin? Why she is absolutely stunning Milord, I didn't know she was capable of such beauty; She and Kohaku look adorable together, I bet they may be married someday"......POP....Sesshomaru hits Jaken on the head. Jaken recants, " I think Rin can do much better than Kohaku, don't you think so master?" Sesshomaru continues to look on at Kohaku and Rin dancing, he notices that Rin and Kohaku are dancing close and smiling at each other. Sesshomaru can not resist the annoyed feeling that has overcome him by seeing this. Inuyasha notices the look on his brother's face and knows what he is thinking, Inuyasha sarcastically speaks, "What's The matter Sesshomaru? Is something you're seeing upsetting you?" Sesshomaru gives Inuyasha a quick irritated glance from the corner of his eye and walks off not responding. After dancing with Kohaku and a couple of other young men from the village who have requested a dance, Rin can hardly wait to speak to Sesshomaru. She approaches him, "Lord Sesshomaru, I'm so glad you came. I was afraid you would be too busy handling your empire to make it here." Jaken responds for lord Sesshomaru, "Silly Girl, Lord Sesshomaru has never missed not one of your birthdays in 7 years, why would he miss one now?" Rin bends down and lifts Jaken up to hug him, "Oh master Jaken your right, how could I doubt Lord Sesshomaru?" Jaken squirms in Rin's arms, "Stop it Rin, shoo...you know I hate it when you do that." Sesshomaru reaches into his sash and pulls out a small box, "Rin, this is for you." Rin quickly opens the box, "It's a beautiful white pearl Barrette, Oh Lord Seshomaru I love it. " Sesshomaru comments, "Well well, Toran really out did herself. I did not expect this big of a turn out." Rin replies, "She's been wonderful to me Lord Sesshomaru, she had this beautiful dress made for me and she set up my hair and all the food for the celebration. I can't thank her enough." Sesshomaru exclaims, " Rin, I will need to speak with you tomorrow, by the lake again." Rin curious of what he has to say asks, "Milord, may we speak about it now?" Sesshomaru explains,"No, we should speak alone. Tomorrow at mid day." Rin confirms, "Okay, I will be there." Rin thinks to herself: hmmm, I wonder what this is all about. Lord Sesshomaru can be so mysterious sometimes. At that very instant and all of a sudden the celebration is interrupted by loud screams and chaos. Sesshomaru and Rin both look up and there are several evil demons approaching. The villagers are frightened because these demons are in true form and horrifying.